Young playmakers such as Zac Stacy demonstrate potential for a bright future from the Rams. The St. Louis Rams went into Seattle wanting to show something. The Rams looked at it as an opportunity, taking a two-game win streak on the road against arguably the best team in the NFL — a team they came just one yard short of upsetting two months earlier on Monday Night Football. What the Rams showed Sunday wasn’t good. Seattle effectively dominated St. Louis from start to finish, shutting down the Rams’ running game, intercepting two Kellen Clemens passes and limiting the visitors to just 158 total yards of offense as the Rams lost 27-9 at CenturyLink Field. "We played a real good football team today and didn’t play well," Rams coach Jeff Fisher told reporters. St. Louis, which finished the season at 7-9, rushed for a season-low 13 yards on 18 carries. Rookie running back Zac Stacy, who entered the game needing 42 rushing yards to hit 1,000 for the season, finished with 15 yards on 15 carries. His longest run went for seven yards, which meant on his other 14 carries he gained just eight yards. The defense wasn’t bad, despite Golden Tate burning the secondary for 129 yards and a touchdown on eight receptions. Robert Quinn had one of four Rams sacks, finishing with 19 on the season but falling just short of Robert Mathis’ NFL-high 19.5. With a season-high 12 penalties — the third consecutive road game with 11 or more — the game reached embarrassing levels in the second half. Defensive tackle Kendall Langford was ejected in the third quarter after what looked like unintentional contact with an official. Safety Darian Stewart was flagged for "verbal abuse of an official" a few minutes later. 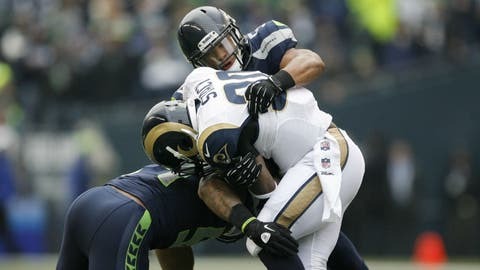 The Rams lost their cool and then lost this game, though you could say the outcome was determined early in the first quarter when the Seattle defense stuffed Stacy on several occasions and then linebacker Malcolm Smith returned an interception for a touchdown for the game’s first score. Clemens, who had won four of his previous six starts, fell to 4-5 on the season as the starter following Sam Bradford’s season-ending knee injury. In his four wins, Clemens threw five touchdowns and no interceptions. In his five losses, he tossed three touchdown passes and was intercepted seven times. The quarterback ended up completing 21 of 30 pass attempts for 157 yards, but most of those completions were short check-downs in the middle of the field. He connected with tight end Jared Cook for a touchdown pass with 4:13 remaining to make it 27-9, but it was too little and much too late to make a difference. The outcome is a disappointing conclusion to a season that offered promise. The Rams will have to wait another season to end their streaks of non-winning seasons (since 2003) and missing the playoffs (since 2004), but the team showed plenty of signs of a bright future. "I’m encouraged," Fisher said. "I’m encouraged about the guys in that locker room and the guys I haven’t met yet." St. Louis, which is 14-17-1 in Fisher’s first two seasons, got some good news before kickoff Sunday when the Giants beat the Redskins. That means Washington’s first-round pick in the 2014 draft, which will go to the Rams as the final piece of the Robert Griffin III trade, will be the No. 2 overall selection. So the Rams will have the No. 2 pick and, likely, the No. 13 selection in the first round with which to fill two areas of need or wheel and deal, like general manager Les Snead has proven apt to do, to acquire more picks and fill more needs. St. Louis will have plenty of work to do in the off-season to close the gap in the NFC West. Seattle finished 13-3, the best mark in the conference, and San Francisco was right behind at 12-4 after winning its final six regular-season games. Arizona even had a bounce-back season at 10-6 and looks to have a solid future. So while the loss in Seattle made for a miserable return flight, the Rams at least know they are headed in the right direction with a strong and improving defense, a quarterback in Bradford who was on his way to his best season before he got hurt and some playmakers on offense such as Stacy and wide receiver Tavon Austin. It wasn’t the ending the Rams wanted, but the 2013 season looks like a solid start for the future.